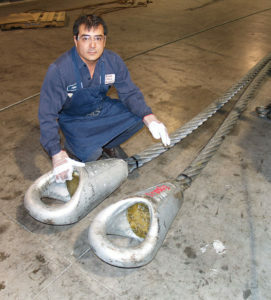 Wire Rope assemblies with Socket terminations on the ends are commonly called Socket Lines. They are custom fabricated for use as boom pendants, guy lines, mast raising lines, backstays, and bridge strand lines. Spelter sockets are terminated to wire rope using Wirelock® socketing resin or Zinc poured. Swage sockets are connected to wire rope swaging the sockets using hydraulic swaging press. A Design Factor of five is applied in establishing Rated Capacities shown, and both Spelter and Swage sockets have a 100% termination efficiency.